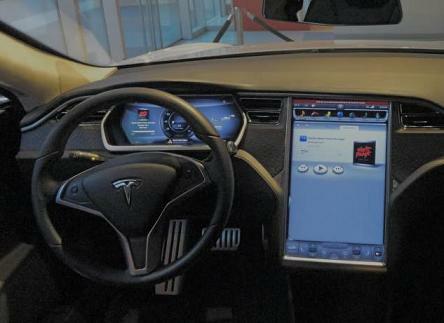 The three big trends in automotive industry in the year 2013 is market success of electric car, growth in infotainment system usage inside the car, the connectivity of the car, both to the infrastructure and to other vehicles. The success of Tesla S model is a clear driver of electric car market growth. On all the parameters of performance Tesla S has performed better than gasoline cars and even other electric cars. Frost and Sullivan says the prices of key electric vehicles have gone down by as much as 18 per cent of their 2012 price. Frost and Sullivan finds that electric vehicle sales stood at 120,000 units in 2012 and estimates this to reach 2.7 million units in 2018. Frost & Sullivan estimates 2013 sales to boost up to 170-190,000 global sales which is more than 50 per cent increase from the previous year sales. Another market researcher ABI Research has forecasted a little different figures for electric vehicles. ABI finds the number of full electric vehicles (EV) shipping yearly will increase from 150,000 in 2013 to 2.36 million in 2020, representing a CAGR of 48%. Not just the developed economies, the emerging economies are also big consumers of cars. For country like India oil import is a big burden, use of more electric driven vehicles, both bikes as well as cars, can help in reducing import burden. When it comes to the connectivity more and more cars are connected to Internet. By 2025, 60 percent of the cars on the road will be internet connected, as per some estimates. Connectivity is becoming important for safety of the vehicle. By integrating vehicle-to-vehicle communication inside cars they can travel faster and safer, and this technology can take care of human errors while driving. Connectivity also enable the adoption of autonomous vehicles. By year 2040 75% of cars are expected to be autonomous/self driving. Another big trend is infotainment technology is becoming a product differentiating feature for many car sellers. 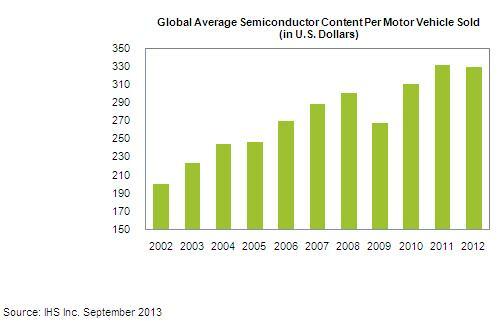 • The average car in 2012 contained about $330 worth of semiconductors, up 65 percent from $200 in 2002, as presented in the chart below. • In 2002, infotainment technology wasn’t really a selling point in motor vehicles because the powertrain was a more important consideration. One decade later, it’s the complete opposite: infotainment systems now can account for as much as 10 percent of the price of buying a new car. • Ten years ago, most cars had no connectivity. Today cars come with various means of connecting with the outside world, including telematics, cellular, Wi-Fi and Bluetooth. Looking at the cost to design a completely new car model, some companies are spending around one-third of the budget just on the in-vehicle infotainment (IVI) and the in-car technology around the system, finds IHS. Mark Boyadjis, senior analyst, Infotainment & HMI observed that there's also a great deal of connected-car growth at present. In fact, motor vehicles are the third-fastest growing connected device behind smartphones and tablets. IHS says it’s likely that in the developed regions, every car manufacturer will offer some type of connected service in its model line-up by 2015.